Home Lifestyle How to Clean Stainless Steel Refrigerator Ecologically? Learn how to clean stainless steel refrigerator without using methods with dangerous chemicals, but using only natural ingredients. Not only dirt, but also bad odors accumulate in the refrigerator. The appearance of bacteria is one of the serious risks that run with household appliances contaminated. For these reasons, cleaning and disinfecting the refrigerator should be a normal process. Effective cleaning is essential in any home. These ecological methods to clean and disinfect the refrigerator, will help us to keep it in optimal conditions. In this way, the health of your family is guaranteed through efficient hygiene. During a prolonged period of use or due to blackouts, the refrigerator can generate unpleasant odors. It may happen that, even if the decomposed foods are eliminated, the bad smell persists. To solve the problem of smell and ensure a clean appliance, there are ecological tricks easy to apply. 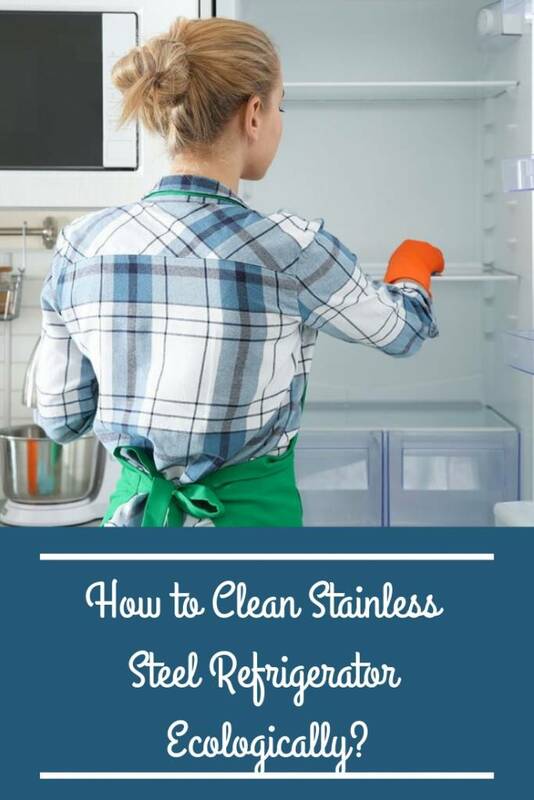 How to clean stainless steel refrigerator? Before starting any cleaning and disinfection procedure of the refrigerator, it is important to disconnect it. It is necessary to leave it for the time necessary for it to thaw and thus release part of the accumulation that is to be eliminated. Then we will remove all food, packaging and products for better access to the entire surface. It is important not to use chlorine or disinfectants to clean the refrigerator. They are difficult to eliminate and can contaminate food, with consequent health risks. Whichever method you choose, to learn how to clean stainless steel refrigerator, it is essential to let it dry before saving the food again. These, like any container, must be thoroughly cleaned before returning them to the refrigerator to prevent them from becoming contaminated again. The bicarbonate creates an aggressive environment for microorganisms responsible for dirt and odors. When we think about how to clean stainless steel refrigerator, we immediately think that we need to use products that increase the effectiveness of that process. One of the best, and also very economical, is sodium bicarbonate. It has a high degreasing and antibacterial power that eliminates traces of food and accumulated dirt. Mix two tablespoons with a few drops of lemon in a liter of warm water and rub inside and also outside. We let act for five minutes and then we pass a dry cloth to remove the remaining moisture from the internal and external surfaces. If we mix a handful of salt in four liters of warm water, we will obtain an ideal liquid for cleaning the refrigerator. We wet a sponge and work on the internal and external surfaces. Thus, we eliminate all traces of dirt and substances harmful to health. Another interesting option is cleaning with vinegar. This excellent antibacterial with high disinfectant power is ideal for cleaning of highly contaminated areas. We mix half a cup of white vinegar in a cup of water and proceed to clean the inside. We can use an atomizer, let it act for five minutes, aerate and dry. Using this type of oil you can eliminate difficult spots without leaving traces. Four tablespoons of olive oil mixed with three of lemon juice are ideal for cleaning the stainless steel external surfaces of the refrigerator. This remedy removes traces of dirt and spills without leaving a greasy feeling. Leave on for 10 minutes and clean with a dry cloth. Tea tree oil is another natural product with excellent disinfectant properties. Eliminates dirt and odors. Two tablespoons of tea tree essential oil diluted in a cup of warm water will suffice. We will use an atomizer for the internal surface and then remove the excess with a microfiber cloth. The best way to eliminate odors from the refrigerator is to rub the area with a sponge impregnated with lemon juice and let it act for five minutes. Its citric acid has effective antiseptic effects to clean surfaces in depth. We can also place the juice of three lemons in an atomizer bottle next to two cups of warm water. Apply by the surface, let it act for several minutes and remove with a dry cloth. The lemon not only has good antiseptic properties, but also helps to leave a good smell in the fridge. One way to maintain a good scent in the fridge is to moisten cottons in some aromatic essence and store them in one of the drawers. The vanilla ones are very suitable. Lemons cut in half with embedded cloves, ground coffee or their remains achieve the same results. As an alternative to eliminate the bad odor of the refrigerator can be used a piece of charcoal, whose effectiveness is unquestionable. An onion cut in half can have the same function, as long as you leave it alone for one night. These 12 ecological methods to clean and disinfect the refrigerator will give excellent results. They are simple, based on natural, economic products and their results are guaranteed. With them we will have a very clean fridge and our health will be assured. There are several other cool home cleaning hacks you could try, but these 12 guarantee success. Don’t forget to SHARE how to clean stainless steel refrigerator with your friends and family members on your social networks! What Causes Hair Loss in Women and What Can You Do to Stop It?